so how is it different from DataCore/Virsto? Not sure about Data Core but Virsto operates only in conjunction with server virtualization and the data hypervisor here stands outside server virtualization.Ray LucchesiRay@SilvertonConsulting. Virsto in a nutshell is an appliance that does storage consolidation (data plane). and management interface (control plane). it is limited to compute virtualization environments because it is most relevant in these environments and it is a good entry point. There are several storage virtualization solutions available(some pure software, some mostly software with little bit of flash), the problem is they can't break the traditional thinking "storage=hardware". I work at Virsto, so I'll get that out there up front. In describing what we do, using the server hypervisor as an analogy for the "storage hypervisor" is very apt. Server hypervisors did two basic things: they virtualized CPU/memory resources to improve flexibility, and they increased the ability to utilize a sorely underutilized resource. That's very similar to what we do at Virsto. We virtualize underlying heterogeneous storage, providing storage objects that look like VMDKs or VHDs to the hypervisor, and allowing storage operations to be performed with very high performance at the VM (instead of the LUN) level (failover, replication, snapshots, etc.). This is similar to the ease of use benefit that NFS provides, but we're doing it for block-based storage. The second thing we do – and what we see as setting ourselves apart from pure storage virtualization plays – is that we significantly increase the ability to utilize a sorely underutilized resource… your storage. With the strategic placement of a log architecture into the virtual storage layer, we can take storage devices that today may only be producing 30-50 IOPS (from the point of view of application IOPS) and have them operating (from the point of view of guest VMs) at 400 – 500 IOPS. This 10x speedup varies depending on what your core storage technology is (7.2K, 10K, 15K) but it gives you a huge performance boost without requiring that you purchase any additional hardware. This is very different from a caching approach, which not only requires that you buy faster hardware to create the caching tier to get the speedup, but also achieves its speedup with generally 70 – 90% less capacity (log vs cache). what would be missing from the IBM SVC in your point of view? This post prompted me to make a couple of observations to see if I appreciate your intent more fully. This is in two parts. At a high level of abstraction, a storage system is implemented as a special purpose computer. The special purpose is to move data from memory to magnetic disk very efficiently. The data arrives in memory because an application requests this using a storage protocol that causes the memory of its computer to move that data to the memory of the storage system. All computing involves layers of abstraction. For example, in storage systems, the address of the data on magnetic disk is highly abstracted from the address an application uses to store its data. For a virtual machine architecture, abstraction layers are crititcal decisions. They have far reaching implications for software architectecture. For example, bad abstraction choices, such as hard coding an IP address into a business application, damage the ability for resources to be fungible to a workload. I suggest that a problem with storage systems is lack of an open, well architected set of abstractions suitable for software development. As is the case with networking, storage suffers from an architecture that has poor programming abstractions. See Scott Shenker, et al, on how this might be addressed in networking via OpenFlow and what has become known as software defined networking (SDN). Note the emphasis on "software" as in programming and its modern architecture of abstractions. Similarly in storage systems, a more "programatic" set of abstractions is required for better resource utilization with workload variation. Unlike application state and the relatively small size of its compiled image which can be moved rather quickly from one compute node to another, an application's data is many orders of magnitude larger. Therefore, unlike live VMotion in VMware, storage systems aren't like to move data from disk to disk as a means of improving IO performance. 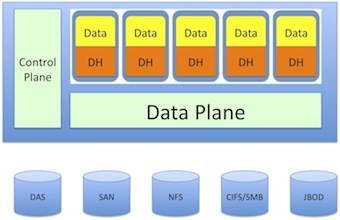 I believe this has important implications on the architecture of the storage system data plane that are unique to storage. It suggests a pool of controllers with CPU and memory that allows IO processing to migrate from one controller node to another as IOPS fluctuate for an application. But, the data pool itself is static with replication of data providing redundancy for data protection, but not for migrating data to another node for better IO performance. As always, I find your posts thought provoking. Thought provoking post, thanks for sharing. Data hypervisor seems like a path to 'Information hypervisor' of sorts. While 'Data' abstracts physical concepts such as structured, un-structructed, accessed via protocol A/B/…, located on LUN/VMDK/.., stored on JBOD, Array, DAS, NAS… the 'information' abstracts business concepts such as mission-critical, compliance related, rapid/low change level, quick/rare business access level, business-confidential, scratch etc. If you look at business function of marketing today – I can see them using 'information hypervisor' of sorts some day – which could be based on your 'data hypervisor' plumbing. Imagine aggregating, analyzing and making sense of 'information' which streams in from social networking 'data hypervisor' or internal business data hypervisors or some marketing research firm's public data hypervisor that could be plugged / unplugged into the 'information hypervisor' as a paid/free choice. I like the Information Hypervisor (IHV) idea. Going beyond protocols and into indexing and searchability of the data, hashing it for faster deduplication, replication, data mining. Virus scans could move from the edge to the core, organizations could find information anywhere independent of protocol type. There was a really cool technology we worked on at VERITAS called VxMS which was a mapping service which could take any block device and analyze it's internal filesystem structure so you could do file level restores from block level backups and snapshots. Baking in that kind of tech would make for a powerful IHV solution. I like your article. What you outline here is somewhat akin to where we're headed at OS NEXUS with QuantaStor. QuantaStor runs on commodity hardware and as a virtual machine under all major hypervisors. We chose to build on top of Linux for ease of support and maintenance but have focused the design of the product towards making life easy for the virtualization admin. Where we're unique is in the storage management layer design which incorporates scale-out grid management, and multi-tenancy. Looking ahead the enterprise and managed hosting companies will need a way to boost efficiency by another order of magnitude. As you point out, that's going to require a solution that uses commodity hardware top to bottom, I think you're spot on. Thanks Ray. I think the commodity software + commodity hardware is almost there today so it will be interesting to see the data hypervisor merge into the mainstream over then next few years. With Xen/KVM and OpenStack Swift, Gluster, Btrfs, SCST/LIO, etc. there's a real formation of critical mass there. I think the challenge is really in bringing all those complex technologies together under one umbrella and I think that'll take a long time for the open source to produce. It's interesting, it seems OSS is great at solving some of the really nasty low level technical challenges like hypervisors, filesystems, and kernels but is generally not so good at tackling the management complexity problems (certainly with a few exceptions).